Welcome to the homepage of The Lancashire Webring! The Lancashire Webring is open to all business and private Web pages created by or for Lancashire people. (The Lancashire Webring reserves the right to reject any sites which we feel would not be beneficial for the webring as a whole). That's all there is to it! The Lancashire Webring is about creating traffic around our Web pages and hopefully helping to create a community spirit among page creators and visitors. (1) Fill out the following form. Keywords: Enter up to 20 keywords to describe your site. Leave a space after each word. (2) Once you have clcked "Submit Site" almost in the twinkling of an eye or faster you will receive via email an html fragment from The Lancashire Webring. Copy & paste the fragment onto the page you wish The Lancashire Webring to appear. If you are unsure about copying and pasting the basic method is described in red below. NOTE: If you are not responsible for your Web Page just tell your Webmaster that you wish to join the Lancashire Webring and give them a copy of the code - they will know what to do. The fragment will look similar to this (see box below) except that "YOUR_EMAIL_ADDRESS" and "YOUR_NAME" will be replaced by your details. "YOUR_ID" is your unique identification number and is allocated by the Webring computer. 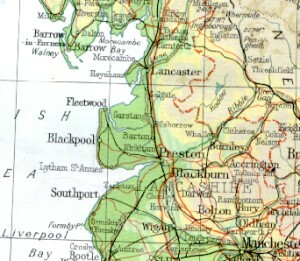 This Lancashire Webring site owned by Lancashire Webring. (i) use your mouse to highlight the code in the e-mail which you will receive from the webring (left click the mouse at the top of the code and do not release while drawing the cursor down over the code). (ii) copy the code (right click the mouse over the highlighted blue code and select 'copy' from the pop-up menu). (iii) Go to your HTML program and left click at the position in your page where you want to place the Lancashire Webring code, then right click and select 'paste' from the pop-up menu. Need to Update Your Link Info?